Based on blockchain technology, encrypted and entirely decentralized, SAFEKEET is the most secure space storage, and you are the only one that can access it! Thanks to Artificial Intelligence and optical character recognition, SAFEKEET automatically sorts your documents. Because our storage needs are blowing up and current market solutions -while expanding- are reaching their limits in terms of capacity, costs, speed, confidentiality and organization, we created Safekeet. 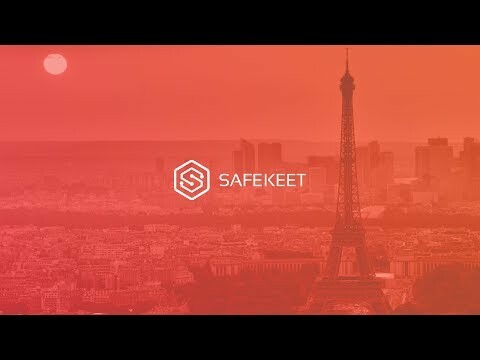 Based on the blockchain technology, Safekeet is a smart digital safe deposit box that combines speed, safety, privacy, accessibility and organization. The power of the tool is enabled by the implementation of an artificial intelligence (that sorts and classifies your documents like a switchman would do at a train station) and the blockchain technology by cutting / duplicating your files to store them on the hard drive of thousands of people offers the fastest, cheapest and safest solution. To fulfill this project, we are launching our ICO where 200 million SafeKeet Tokens (SKT) will be released. On January 15, 2018 at 8:00am UTC, the SKT presale starts with a minimum purchase of 50,000 SKT and with at least 10% bonus will be applied. The presale will end on January 31, 2018 at 8:00pm UTC. From February 1st 2018 at 8:00am UTC, the official sale starts: a minimum purchase of 200 SKT and bonuses can be applied. The presale will end on February 28, 2018 at 8:00pm UTC. Strong team! Good luck guys! Strong team, great use of blockchain technology. I need to understand how this will generate revenue. I will upgrade team score once they have completed KYC.